RidePod™ BT has 4 times the memory, 5 times the battery life and 6 times the speed of MetroCount’s previous tube counter for bicycles monitoring. At MetroCount, there’s always room for improvement. Therefore, we took our already hyper accurate MC5620 Bike Counter and built on its strengths. With 4 times the memory, 5 times better battery life, and improved speed detection accuracy, we welcome you to put our RidePod™ BT to the test. 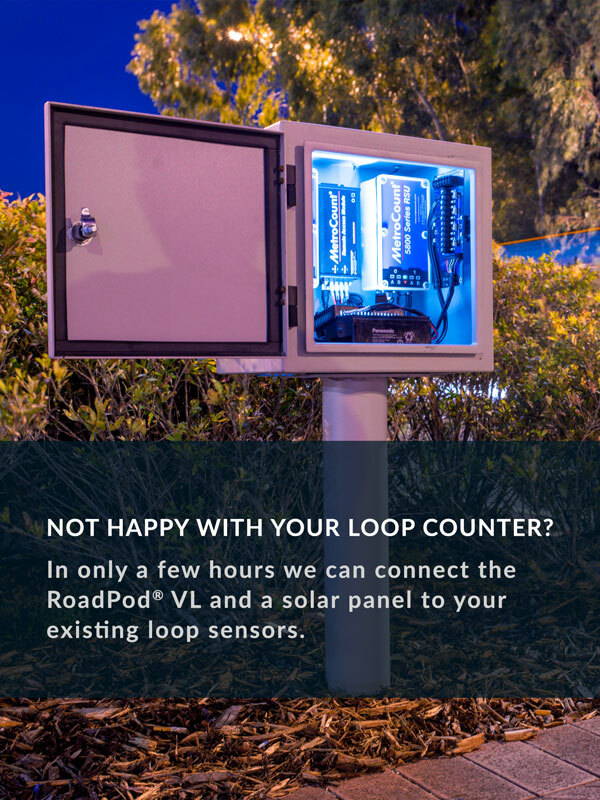 The RidePod™ BT collects axle data from dedicated and on-road bike lanes using two thin-walled pneumatic tubes. Furthermore, this data is analysed by our MTE™ software running the axle information through optimised algorithms. As a consequence, this allows to identify bike clusters and distinguish between bikes, pedestrians, and scooters to present detailed bike volume, speed, and directional information. Classify bike lane traffic – In April, the Belgian Road Research Centre tested the capacity of our Portable Bike Counter in Brussels. Over three weeks, the RidePod collected statistics on volume, speed, and class of vehicles. While the counter performed exceptionally, the faulty installation led to data inaccuracy, so when 2 bikes passed by, the counter failed to correctly identify the second cyclist. However, the video shows the second cyclist didn’t ride over the tubes. Monitor mode distribution – To prevent interactions between cyclists, drivers, and pedestrians, the city of Cottlesloe has recently started monitoring bike trips. We caught up with David Lappan, to discover how bike data fits into the council’s infrastructure plans. After seeing the numbers of riders, the city is willing to survey more paths but on-road lanes seem to cause most issues. In conclusion, Cottlesloe is looking to expand its bike infrastructure. Pilot Testing Cycling Infrastructure – The London Borough of Barking and Dagenham piloted light separation of cycling lanes at two different locations. To evaluate how these treatments affected behaviour, traffic planners utilised MetroCount counters to collect statistics over a 7 day period. In conclusion, the segregation of bike lanes led to increased cyclist activity.